Heat oven to 375°F. Lightly spray 12-inch pizza pan with cooking spray. In 10-inch skillet, cook sausage over medium heat, stirring frequently, until no longer pink; drain well on paper towels. Unroll 1 can of dough on pizza pan. Starting at center, press out dough to edge of pan. Layer sausage and pepperoni on dough. With back of spoon, carefully spread 1/2 cup of the pizza sauce evenly over pepperoni. Top with mushrooms, bell pepper, onion and slices of mozzarella cheese. Unroll remaining can of dough on work surface. Starting at center, press out dough into 12-inch round. Fold dough in half; place over mozzarella cheese, and unfold. Press edge to seal. Cut several slits in top crust for steam to escape. Sprinkle Parmesan cheese over top. Bake 35 to 40 minutes or until crust is deep golden brown. Meanwhile, heat remaining pizza sauce. 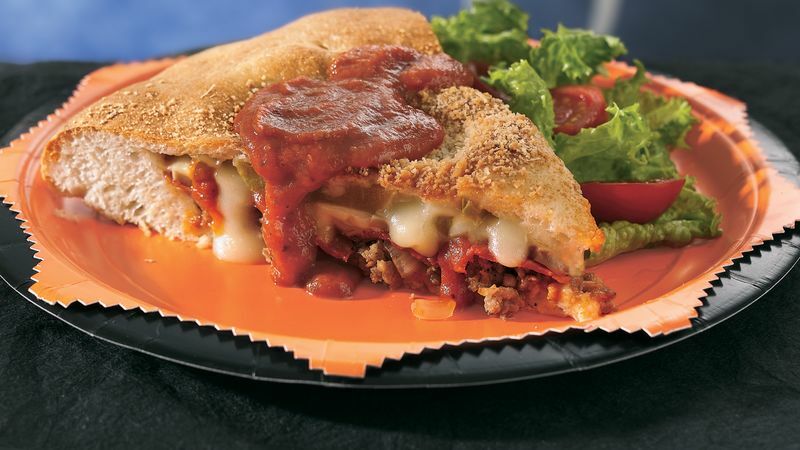 Cut pizza into wedges; serve topped with warm pizza sauce. For a crisper crust, sprinkle about 1 tablespoon cornmeal on pizza pan before pressing out the dough. A pizza stone will also do the trick. For ease in shaping the top pizza crust, draw a 12-inch circle on a sheet of waxed paper. Press out the dough to fill the circle.